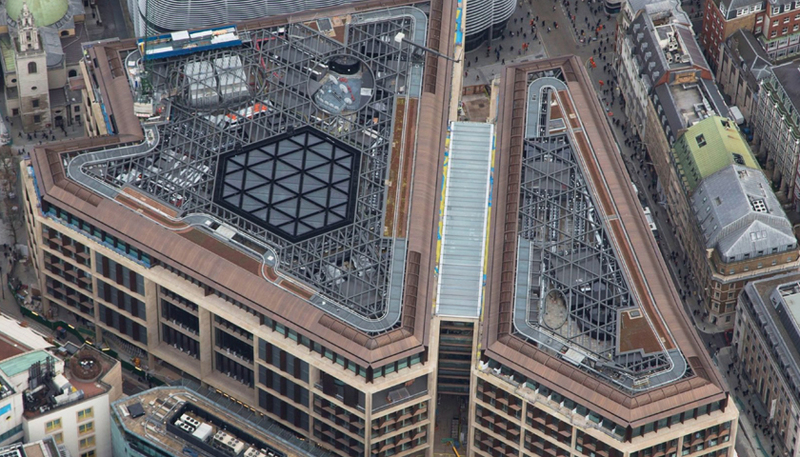 Opening later this month in the City of London, Bloomberg’s new European headquarters is the world’s most sustainable office building, as designed. 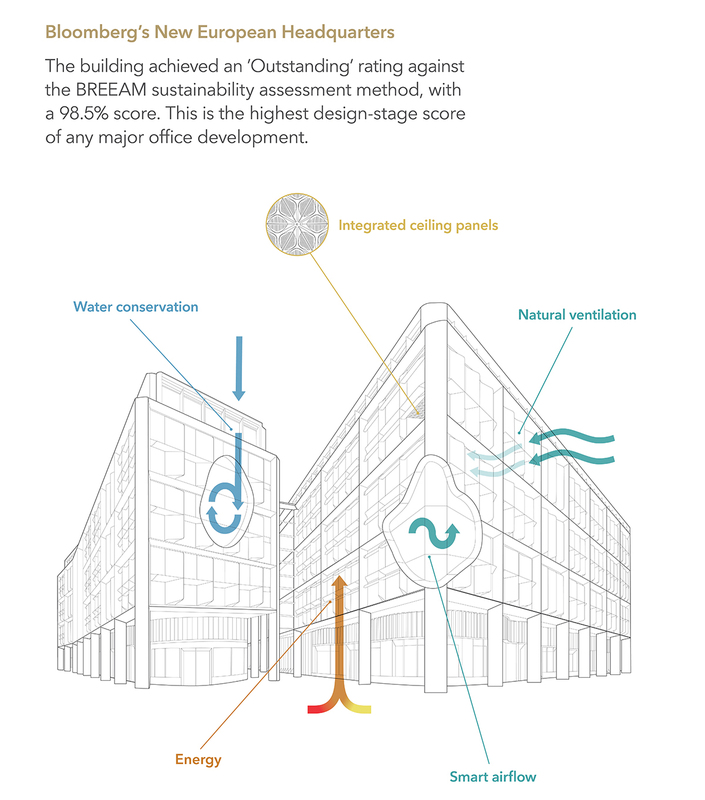 The building achieved an ‘Outstanding’ rating against the BREEAM sustainability assessment method, with a 98.5% score. This is the highest design-stage score ever achieved by any major office development. 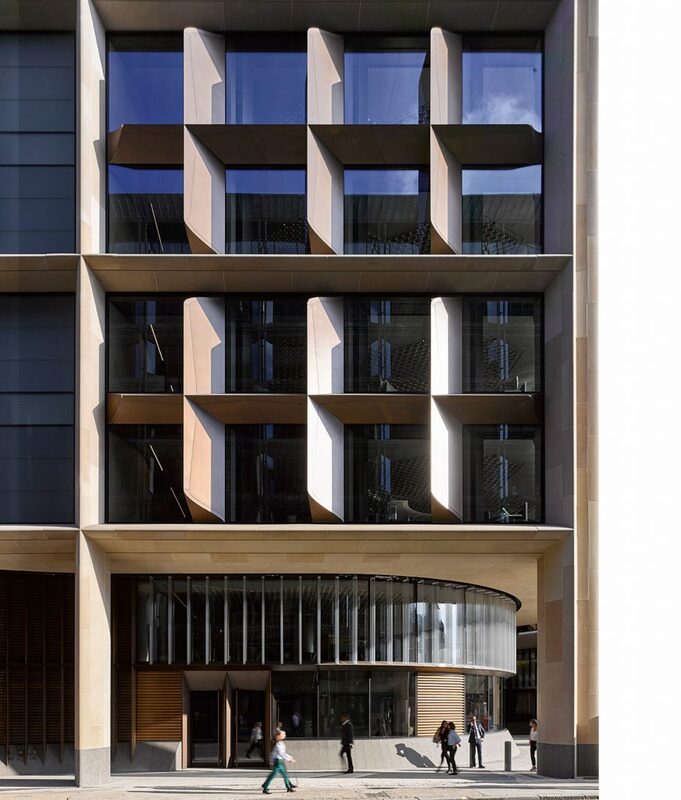 Compared to a typical office building, the new Bloomberg building’s environmental strategies deliver a 73% saving in water consumption and a 35% saving in energy consumption and associated CO₂ emissions. Innovative power, lighting, water and ventilation systems account for the majority of energy savings. Designed to utilize waste products, respond to the building’s external environment and adapt to its occupancy patterns, many of these solutions are first-of-a-kind. •Integrated Ceiling Panels: Bespoke integrated ceiling panels combine heating, cooling, lighting and acoustic functions in an innovative petal-leaf design. The system, which incorporates 500,000 LED lights, uses 40 percent less energy than a typical fluorescent office lighting system. •Water Conservation: Rainwater from the roof, cooling tower blow-off water, and grey water sources, like basins and showers, is captured, treated and recycled to serve vacuum flush toilets. These use net zero mains water for flushing. Overall, water conservation systems will save 25 million litres of water each year, enough to fill ten Olympic swimming pools. 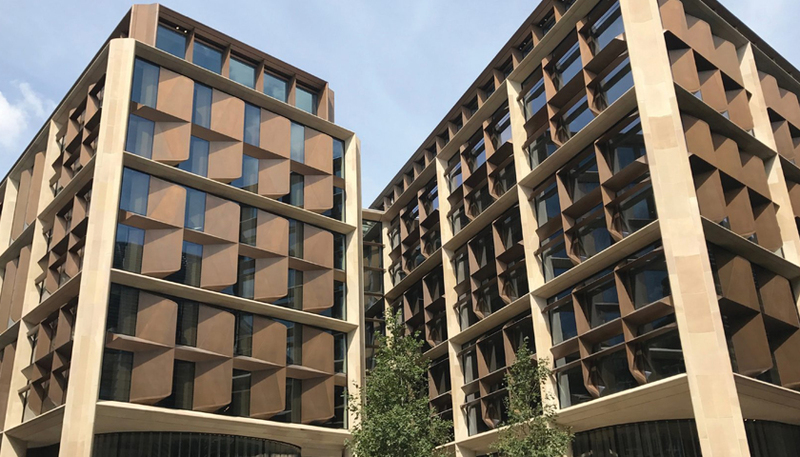 •Natural Ventilation: When ambient weather conditions are temperate, the building’s distinctive bronze blades can open and close, allowing the building to operate in a “breathable” natural ventilation mode. Reducing dependency on mechanical ventilation and cooling equipment significantly reduces energy consumption. •Smart Airflow: Smart CO2 sensing controls allow air to be distributed according to the approximate number of people occupying each zone of the building at any given time. The ability to dynamically adjust airflow in response to occupancy hours and patterns is expected to save 600-750 MWhr of power per annum, reducing CO2 emissions by approximately 300 metric tonnes each year. •Combined Heat & Power: An on-site Combined Heat and Power (CHP) generation centre supplies heat and power in a single, efficient system with reduced carbon emissions. Waste heat generated from this process is recycled for cooling and heating and, in use, is expected to save 500-750 metric tonnes of CO2 each year. Environmental impact management has helped Bloomberg eliminate nearly 700,000 tonnes of CO₂e (41% of CO₂e intensity reduction) and avoid $95 million in operating costs since 2008. With the addition of the new London building, Bloomberg has 34 LEED or BREEAM-certified projects globally. 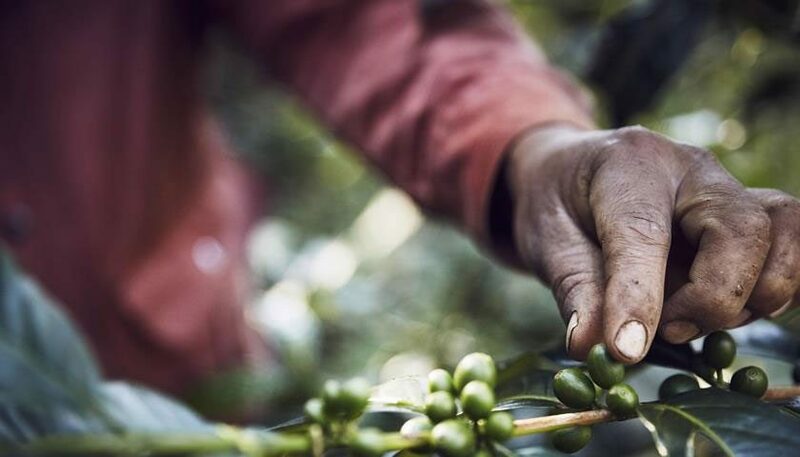 By the end of 2017, nearly 70% of the company’s 19,000 employees will occupy an environmentally certified office. Bloomberg has been a zero-landfill operation in London since 2010; instead waste is recycled, composted or converted to energy. This commitment will continue at the new site, with better waste streaming to enable a greater proportion of waste products to be reused and recycled. Globally, Bloomberg currently diverts 75% of its total waste away from landfills and is targeting 90% diversion by 2020. The new development’s interiors encourage active working, with sit-to-stand work stations for all employees and a central ramp spanning six floors that encourages movement through the building on foot. Two cycle centres and a wellness centre incorporating on-site health services, multi-faith prayer rooms and a mothers’ room, will also be available to all employees.